In The Room Where It Happened! 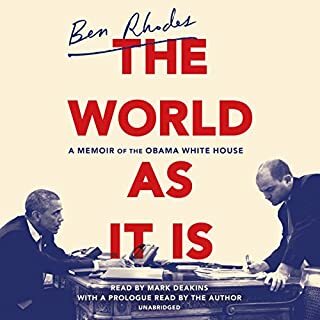 Ben Rhodes puts you in the room where it happened. With an amazing memory for detail, color, and events you yearn to be with him in that room. Until Barack Obama writes his own memoir I have no doubt that The World As It Is will be the definitive history of those 8 amazing years when the U.S. was still the moral leader of the free world and had a president who strove every day to be the best he could be and help us to likewise find greatness within ourselves.